The best production process isn’t the one that gets course content before an audience as quickly as possible. The best process is the one that can reliably deliver high-quality learning content that’s fit for purpose to an audience within an appropriate timeframe. According to the Project Management Institute, ineffective communication is the primary contributor to project failure one-third of the time. And 55% of project managers agree that effective communication to all stakeholders is the most critical success factor in project management. So it makes sense to develop a production process that involves all stakeholders and provides a transparent system everyone can follow. Here are two proven production models that you should consider when developing eLearning. ADDIE has been around since the 1950s. During that time, the model has been the basis of many variations. 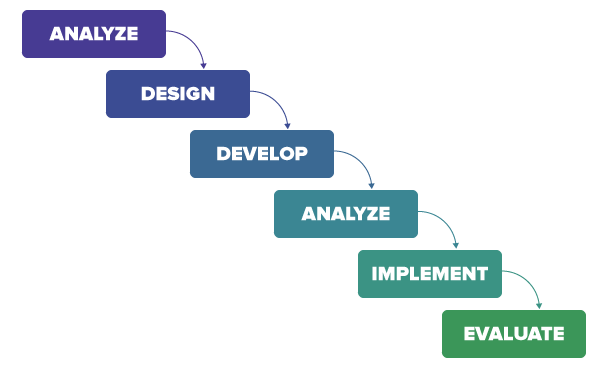 ADDIE is an acronym made up of five words: Analysis, Design, Development, Implementation, and Evaluation. In its purest form, each phase of ADDIE should be completed in turn with the outcomes fed into the next phase. Are there constraints, e.g. financial or political? What are the pedagogical considerations, e.g. audience ability level or prior knowledge? The information gained during analysis informs the design phase. While in design, you can define learning objectives, define and source the content needed to address learner needs, and chunk content into appropriately sized lessons. During the development phase, the outlines determined during design are storyboarded, media assets are developed, and eLearning content is built. Clever use of resources can create efficiencies during this phase. For example, modern eLearning authoring tools like Elucidat enable all members of your team, not just the tech-savvy ones, to rapidly develop quality elearning content. Debugging and testing are also conducted during development, to ensure that newly developed assets are correct and working as expected. The implementation phase takes items created during the development and makes them available to their audience. That can include releasing learning content into an eCommerce LMS or app store and promoting the learning materials by generating interest in them. The summative evaluation phase considers how well the delivered program has been received by its audience and how well it meets objectives established during the analysis and design phases. The information gathered from sources like evaluations, surveys and quiz scores can be fed back into a new analysis phase, and the cycle can start again, to refine the product. Things missed during analysis and design phases may not be picked up quickly enough, or may be difficult to retrofit. If resource dependencies are unexpectedly unavailable, the master plan can be significantly impacted. Changes in scope can be difficult and costly to implement, or can severely affect a large, rigid master plan. AGILE-like design methodologies emerged in the mid-1970s but started to take their current form and gain wider acceptance in the mid-1990s. In contrast to a typical ADDIE process, an AGILE project tends to jump in, produce small pieces of content quickly, and then evaluate, refine, and expand them over several tight iterations. A stream of working deliverables, rather than detailed plans or meetings, is the principal measure of progress. In some ways, AGILE is like many tiny, less formal ADDIE projects linked together. All stakeholders, including instructional designers, developers, subject matter experts, content authors, and clients, meet to brainstorm ways of moving the project forward. All members agree on one or more small segments of the course to be created and discuss in detail what these will look like and how they will function. It often involves multiple small teams developing in parallel, which can require high/cross-skilling. The size of the project: e.g. a very large project might benefit from an ADDIE-style scoping phase to get general agreement on broad aspects, followed by an AGILE approach that produces deliverables that evolve from proof-of-concept models to working prototypes. Project timelines: e.g. tight project timelines might be better served by rapid, AGILE-style development, especially if the team and SMEs are confident of the content. The maturity of the content: e.g. if policymakers are still writing content but you’re being asked to begin development, a soft, partial launch with AGILE deliverables that can evolve as content becomes available might be a good way forward. Senior stakeholder drivers: e.g. Management may want to see results quickly to satisfy a hostile Board. In this case, a protracted ADDIE scoping phase on a large project may not be in the project’s best interests. This guest post is by Steve Penfold, Customer Success Director at Elucidat. Learn more: Stay on top of the latest eLearning ideas, trends and technologies by subscribing to Elucidat’s weekly newsletter.